BEIJING, May 16 (Xinhua) -- President Xi Jinping said Tuesday that China is willing to deepen the all-weather friendship with Serbia to boost their comprehensive strategic partnership. Xi made the remarks when meeting with Aleksandar Vucic, Serbia's prime minister and president-elect, who attended the Belt and Road Forum for International Cooperation on Sunday and Monday in Beijing. Bilateral ties and political trust between China and Serbia are strengthened, Xi said, reaffirming China's willingness to deepen cooperation with Serbia in all areas. Xi said that the two countries should accelerate coordination of their development strategies, accommodate each other's major concerns, and keep close communication on global and regional affairs. Efforts should be made to deepen mutually beneficial cooperation and push for cooperation on key projects and people-to-people exchanges. China supports Serbia in taking a leading role in setting up a China-Central and Eastern Europe transportation infrastructure cooperation center, expecting Serbia to play a greater role in infrastructure, energy, and education. Regarding the inter-governmental memorandum of understanding on Belt and Road, Xi called for greater efforts to enhance practical cooperation and development strategy alignment to achieve common prosperity. 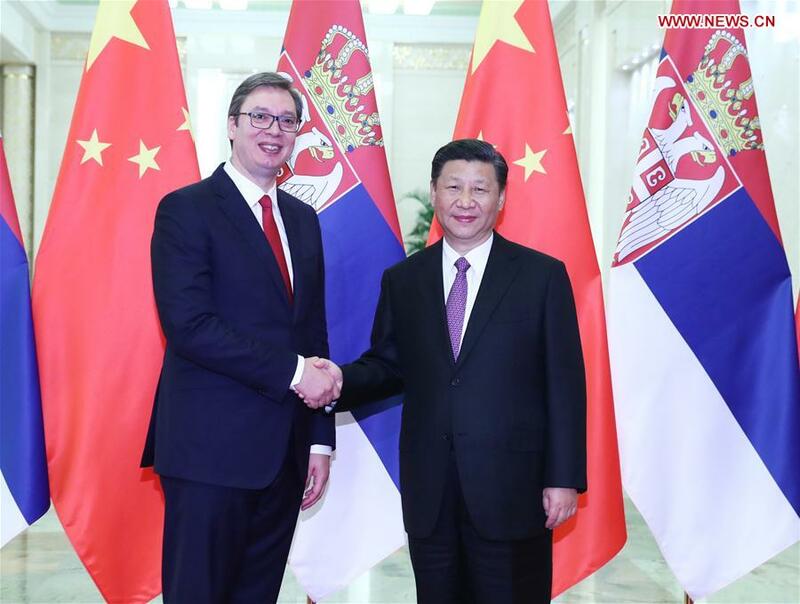 Vucic said Serbia is China's staunch friend and reliable partner. Serbia has benefited enormously from participating in the Belt and Road forum. Key projects of the Belt and Road Initiative have yielded positive results. Serbia expects to deepen cooperation with China in a host of areas including the economy and trade, mining, infrastructure, finance, aviation and tourism. Chinese Premier Li Keqiang also met with Vucic Tuesday. Hailing the Hungary-Serbia railway as an exemplary project in industrial capacity cooperation, Li expected the two sides to seize the good momentum to enhance regional connectivity. Li applauded Serbia's participation in the "16+1 cooperation" framework, hoping the mechanism would produce win-win benefits for all. Vucic said Serbia firmly believes China's economic development will benefit other countries. Serbia is willing to enhance bilateral cooperation in industrial capacity, infrastructure and agriculture, and actively advance the "16+1 cooperation."